Week 11 of 26 and 23 NEW SKUS!! We are going on week 11 of our aggressive 6 month roll out plan where we promised to drop a new product or flavor every week for 6 months. Up to this point we have dropped 20 new skus including our Dragon Fruit Flavor Line, New Isolate Breakfast & Snack Series, a handful of NutraBio Naturals Products, and the ever popular launch of ALPHA-EAA! What do we have for you now? The explosive new flavor Strawberry Lemon Bomb launching in our full stack of PRE, INTRABLAST, & RELOAD!! This flavor is a delicious and sweet blast of strawberry followed by an explosion of lemon flavor. This fruity flavor is a great new addition and adds excellent variety to the NutraBio line-up. 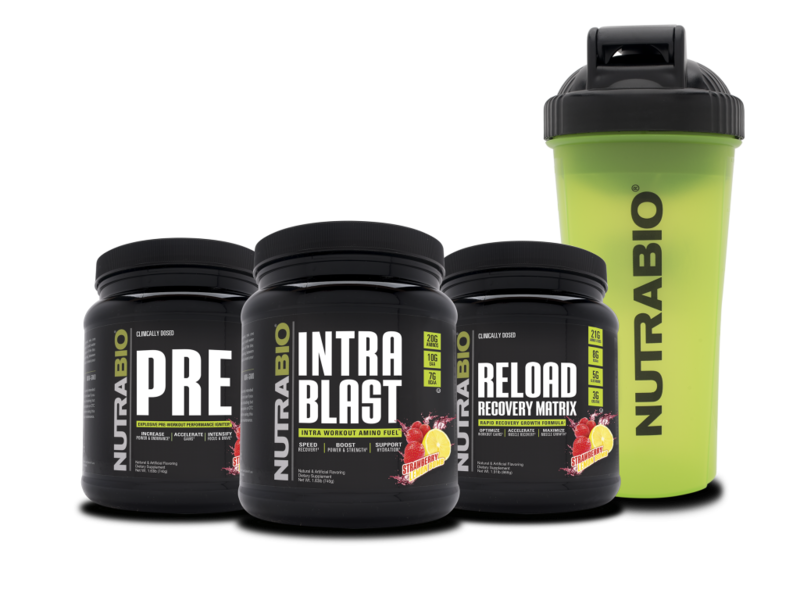 Be sure to stay tuned for all the New Product & Flavor Launches here and our FaceBook group NutraBio’s Biocrew!! Get ALL 3 Now for $99 Plus a Free Green Shaker!! !